Grilled Cod, Barbecued Pork Loin, Main Courses for July 12, easy recipes. Cod: In a small bowl whisk together the vinegar, mustard, oil and 2 tsp dill weed. Spoon over the cod. Cook on barbecue grill, covered or partially covered, 14 - 18 minutes, without turning. OR put on baking sheet and roast in 400 F oven for 15 - 20 minutes, depending on thickness. It will be opaque and flake easily with fork when done. Transfer to a small platter and serve, Caper, Green Olive Tarter Sauce on the side. Caper, Green Olive Tarter Sauce: Chop olives. Put all ingredients in a small bowl and stir to combine. At least 2 hours or up to 8 hours earlier: Mix all ingredients for marinade/barbecue sauce. Cut a lengthwise slit down the center of the pork loin almost all the way through. Leave about 1/4" (.5cm). You want to be able to open it like a book. Spread the pork out in a deep dish and pour the marinade over. Turn the pork to coat, cover and refrigerate. 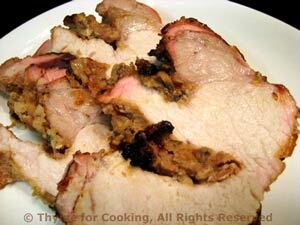 Dinner time: Remove pork from marinade, reserving marinade, and let drain a bit. Put reserved marinade in a small saucepan and bring to a boil. Boil for 5 minutes. Allow to cool. Remove 1/3 cup to use as a basting sauce and reserve the rest to use as a dipping sauce for this meal and with the leftover pork. Finely chop mushrooms and Prosciutto. Mix mushrooms, Prosciutto and bread crumbs in a small bowl. Add 3 tbs of marinade / barbecue sauce and mix well. Lay pork out with cut side up. Spread the stuffing on one side up to 1/4" from the edges. Fold the other side over and tie well with kitchen string: Cut five 10 inch lengths of string and wrap around pork and tie every 2 inches or so - making certain that you do one as close to each end as possible. Cook pork on barbecue grill for 45 - 60 minutes or until done, basting 3 or 4 times with the Barbecue Sauce. When done, slice and serve with more Barbecue Sauce on the side. Could also be baked at 400F for 45 - 60 minutes or until done but you won't get the sugary crust. It is done when 'juices run clear', so - either poke it, slice it and take a peak or use a meat thermometer. An instant read meat thermometer is best for a nice, juicy roast. Cook it to an internal temperature of 145F (62C) See techniques. Mix chili powder, Worcestershire, oil and garlic. Slice steak on the diagonal, across the grain into strips. Clean the mushrooms and cut in half. Add mushrooms and steak to chili powder mixture and toss to coat. Cook on barbecue grill in a pan or sauté in a nonstick skillet over medium high heat (with a bit of olive oil) on the cook top. Either way cooking time is 3 - 4 minutes. Slice tomato, then cut slices in half. Slice avocado (if you need a reminder see techniques). Put lettuce in large salad bowl tearing if necessary. Toss with some of the dressing. Arrange steak, mushrooms, tomato and avocado on top. Serve with remaining dressing on the side. Put mustard, lemon juice and yogurt in small bowl and whisk well to combine. Slowly add olive oil whisking constantly. Add garlic, herbs and Parmesan. Dressing should be thick. This will keep a week in the fridge. Cumin adds a hint of Northern African fare to this marinated chicken breast. Mix oil, vinegar, Worcestershire, mustard, cumin and oregano. Spoon over chicken breasts and let marinate for 10 minutes. Cook on barbecue grill 6 - 8 minutes per side or sauté in nonstick skillet for about the same amount of time. They should be nicely browned and juices should run clear when pierced with a knife. Remove, slice and serve. A cold salad can be just the thing for a hot summer evening. Other than the eggs, nothing is cooked; just assemble and serve. The small mozzarella balls are great for tossing with a salad; if you can't find them, just roughly chop half of a larger, whole mozzarella. Boil eggs. Prepare lettuce, tear and put into a large salad bowl. Open and drain tuna. Cut mozzarella and tomatoes in half. Remove pit from avocado and slice. When eggs are done, cool, peel and cut into pieces. Tear large basil leaves. Snip chives. Make vinaigrette: Mince garlic. Whisk vinegar, lemon juice, mustard and garlic together in small bowl. Slowly whisk in oil until emulsified (thick and well combined). To finish: Put lettuce, herbs in a salad bowl. Add 2 - 3 tbs vinaigrette and toss well with to combine. Taste, adjust. Add tuna, tomatoes, eggs, mozzarella and avocado and toss gently. Serve, extra dressing on the side. Turkey cutlets are an economical and flavorful meat, cut from the turkey breast, and can be used in place of, more expensive, veal scallops. They should be about 1/4 inch (.6cm) thick. Because they are so thin they take well to marinades and cook quickly, without drying out. Mix all ingredients except turkey. Spoon over turkey and let marinate for 10 minutes. Remove from marinade and cook on barbecue grill for 3 - 5 minutes per side or until done. OR sauté in nonstick skillet for 4 - 6 minutes a side or until done. Remove and serve.